In partnership with The City of Boston, Mass Poetry is proud to present Raining Poetry. 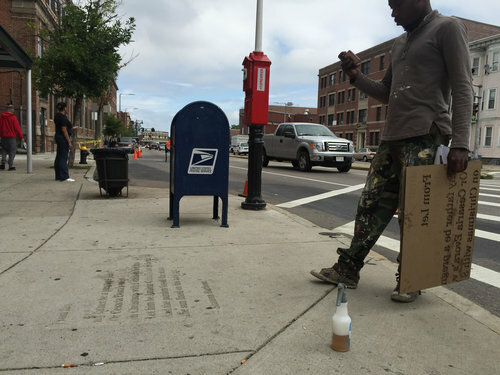 Using a biodegradable water-repellent spray and stencils made by local artists, the city's Mural Crew is setting out to place poems throughout the streets of Boston. The spray vanishes once dry, so the poems are invisible - until it rains. Once wet, the area around the poems will darken, and Bostonians will be treated to short poems as they walk around the city. 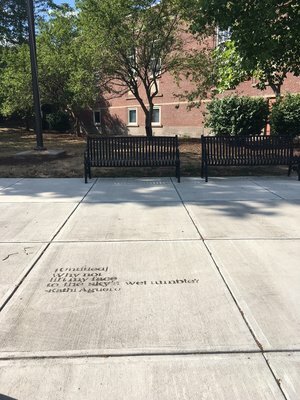 Boston’s Poet Laureate, Danielle Georges, has selected the poems for the art installations across Boston and its neighborhoods, including works in several languages. With Raining Poetry, we are able to bring more poetry into the everyday lives of the unsuspecting. Where have the poems appeared? Who have the poets been? Who have the stencil artists been? Tell us about your history and relationship with poetry. I’ve been writing poems, and reading and appreciating poetry for a while now. I’ve also been teaching poetry in college classrooms and the community for about 20 years. At Lesley University, my home institution, I work with teachers and educators on how to use poetry and the arts as learning tools. Just last year I became the city of Boston’s poet laureate, a wonderful honor and position in which I get to serve as an advocate for poetry, language, and the arts. The Poet Laureate Program is charged with generating new opportunities for education, awareness, and the promotion of literacy through the beauty and excellence of poetry, which I think is a great thing. My role involves raising the status of poetry in the consciousness of Bostonians. My mission is to make poetry available and accessible through programs, civic events, public readings, and collaborations. How does the Raining Poetry project fit with your work as Boston's poet laureate? First, it’s a collaborative project: Mass Poetry is involved, the Mayor’s Office of Arts and Culture is involved, the Poet Laureate Program is involved. Visual artists are also involved. It’s been great to have Lesley College of Art and Design students Morgan French and Marco Kienle make several of the first stencils and Miles Donovan at Artisans Asylum create another set as the project is being launched. 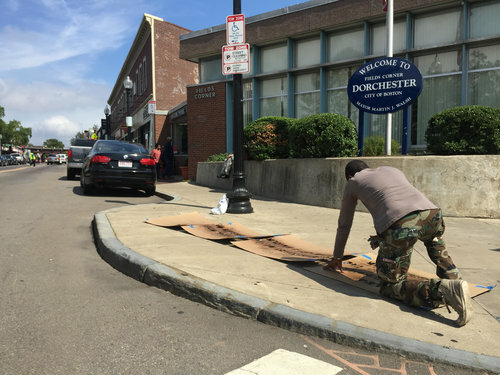 The City’s mural crew is in the mix, installing the poems on Boston streets. Second, it’s a public art project—as the poems are and will be installed in public sites in Boston, and meant for everyone. I think this is a wonderful way to bring poetry to the people. What do the chosen poems evoke for you in terms of rain and/or Boston? I thought it was important to have the first poems for this project be somehow connected to Boston—so I chose poems from writers with Boston ties. I wanted to draw work from poets influential in the Boston-area literary, educational, or cultural realms. This first go-round I chose Langston Hughes, Elizabeth McKim, Barbara Helfgott Hyett, and Gary Duehr. After identifying the poets, I read their work for water themes. Not all the poems are rain-themed though! Where would you like to see poems placed next? 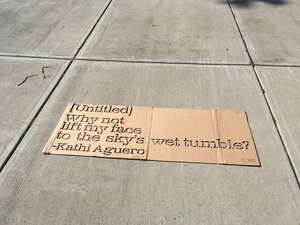 The first poems are being installed in or near the city’s downtown area. I’d love to see poems move into the neighborhoods: from East Boston to South Boston, from Hyde Park to Roxbury, from Mattapan and Jamaica Plain to Allston—in all the neighborhoods really. Danielle Legros Georges is Boston's Poet Laureate. Her mission is to make poetry available and accessible through programs, civic events, public readings, and collaborations. She teaches at Lesley University, lives in Dorchester, and is the author of two books of poetry, Maroon and the forthcoming The Dear Remote Nearness of You (Barrow Street Press, April 2016).